Are Animal Workouts a Good or Baaaaa-d Idea? Yes, believe it or not, Goat Yoga is a thing. Founded by yoga instructor Lainey Morse in Albany, Oregon, it's an adorable yoga workout where participants enjoy their downward dogs and savasanas while goats meander through the class, sometimes climbing onto or cuddling up with animal-loving participants. Launched in mid-2016, it didn't take long for the class to take over the Internet, landing press mentions in the New York Times, The Oregonian, The Washington Post, People.com, and the Yoga Journal, not to mention a steady stream of Instagram posts featuring people doing yoga with goats. Of course, goats aren't the only animals to take center stage in traditionally-human workout routines. There's also cat yoga, dog yoga, horse yoga, and bunny yoga. Not to mention the more "traditional" forms of human-and-animal activities like running and boot camps. But the flood of animal-and-human workouts on social media does beg the question—what's the deal? Are these types of workouts gimmicks to get clicks and follows? Are they inherently beneficial to the species participating? Should you join in immediately? Is a downward dog on top of a horse worth the risk of falling off? Before you roll your eyes at the latest harebrained (it's a pun—get it?) idea thought up by the fitness industry, this is really nothing new. Humans have been toiling alongside animals for millennia. Whether herding sheep, riding horses, or leading oxen, most of history tells us that humans and animals are practically meant to work up a sweat together. Sure, bunny yoga seems a whole lot more...ridiculous?...than riding a horse on a cattle drive. 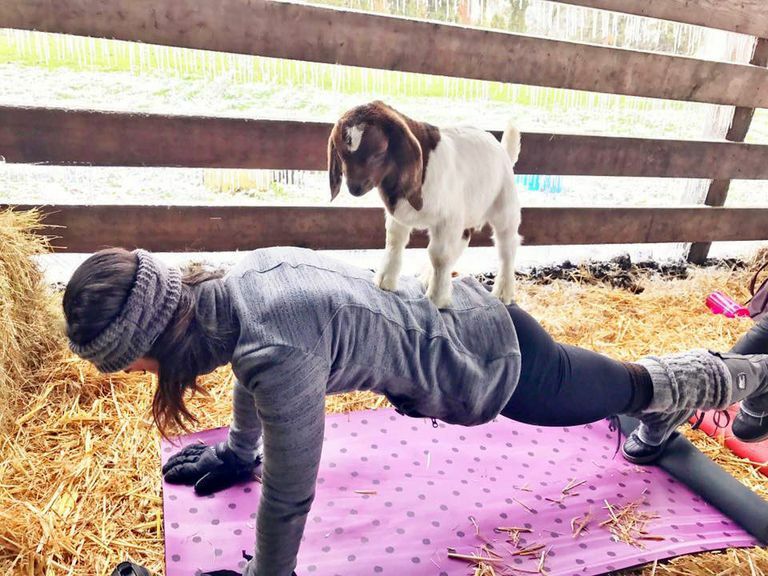 And certainly there's no obvious physical benefit to having goats take part in your next yoga session (although, come to think of it, holding a plank with a goat on your back certainly seems like an added challenge), but maybe the real benefits have more to do with the human-animal bond than whether they'll make you a better athlete. There are, in fact, well-researched benefits to pet ownership and exercising with pets, but research on non-pet workouts, such as goat yoga, haven't been thoroughly examined. That said, it's possible to draw some possible conclusions about potential mental and emotional benefits based on the research that's currently available. Specifically, a 2013 American Heart Association Scientific Statement indicates dog ownership may be responsible for a reduction in cardiovascular disease risk, while a 2008 study published in Cancer Epidemiology, Biomarkers, and Prevention found that pet ownership of dogs or cats was associated with a lower risk for non-Hodgkin's lymphoma. These are just a few of the well-documented health benefits of owning a pet. Dog owners tend to be more active than non-dog owners, but that begs the question, "Which came first, the exerciser or the dog?" In other words, are active people more likely to own dogs, or does dog ownership encourage more activity? A 2008 study published in the Journal of Behavioral Nutrition and Physical Activity found that, in fact, adopting a dog appears to lead to an increase in physical activity. So yes, the very act of adopting a dog may help make you more active. Tricia Montgomery, the Founder and CEO of K9 Fit Club, which offers 20 parallel workout programs that people do with their dogs, such as PUPilates, NamaSitStay, and Bow Wow Bootcamp, says, "Today research shows that dogs actually appear to help those who are obese overcome embarrassment about exercising or doing physical activity in public." This is significant, as anything that can help break down barriers to exercise, particularly in overweight and obese populations, is worth examining further. It's also worth noting that K9 Fit Club is accredited by Healthways/SilverSneakers, which means Medicare pays for people to attend K9 Fit Club classes. That's a pretty good deal. So if you're on Medicare and you have a dog, check it out to see if there are programs in your area. It's not just pets or domesticated animals that make a difference. Among the studies researchers looked at when conducting this review was a study where patients with various psychiatric disorders took care of farm animals during a 12-week intervention. Those who participated in the intervention saw a six-month post-intervention decrease in anxiety, indicating interactions with non-pet animals may lead to mental and emotional benefits in humans. For individuals who like animals, having the chance to exercise while bonding with fuzzy, four-legged creatures may be exactly what they need to enjoy the experience. Deborah Glovier, a K9 Fitness Trainer, marathon runner and founder of K9 GRIT, says, "As a former solo marathon runner, I can tell you from personal experience that running with my dogs is way better!" Tonya Wilhelm, one of the top 10 dog trainers in the United States and the founder of Raising Your Pets Naturally, agrees, "I've actually said numerous times that if health clubs and other places of business catered to dogs and their humans, they would be successful. I know for me, working out and getting to the gym is always on my to-do list, but never quite a top priority. When people are spending time with their pets and exercising with them, it's a win-win." And who could argue that Goat Yoga doesn't sound fun? Goats are cute and curious. Even the thought of spending an hour or two surrounded by little-horned beasts is probably enough to make you smile. Granted, goats may be a bit distracting, but you don't go to Goat Yoga assuming you won't get distracted. You go assuming you'll have fun while getting a little bendy. You already know exercise is good for you, but regular exercise is essential for all species of animals. Dr. Erin Stair, a medical doctor known as Dr. Eeks, makes it a point to always exercise with her dog, and points to the wise advice of her dad, a veterinarian, as to why it's so important for pets, too, "My dad always warned me about pet obesity, which, like obesity in humans, leads to diabetes and heart disease. I figure since I love to work out, why not do it with my dog? He needs exercise, too. Plus, dogs make the best running partners, especially through secluded areas where they're likely to scare people away." The thing is, you don't just have to stick to running with your dog for a good workout. Dr. Stair cites her own routine at the dog park, "I do pull-ups on the dog fence, push-ups on the bench, squats back and forth, crab walks, bear crawls, and so forth, all while playing fetch with Barnaby. I can't tell you how much time it saves me, and I'm getting a better workout than at the gym, all while playing with my dog." As more people move to city centers, often in apartments or living situations that don't allow pets, they're looking for alternative ways to interact with animals. Not everyone can live on a farm, but maybe they can take an afternoon to do Goat Yoga. Not everyone has the desire or time to own a cat or bunny, but they can enjoy petting one of these furry animals during an animal-focused workout class. Such opportunities may seem "gimmicky," and to a certain extent, they probably are, but they can also serve a real purpose, offering animal interactions to humans who otherwise wouldn't have the opportunity. Exercising with animals isn't always a walk in the park (except, of course, when it is literally a walk in the park). The reality is that animals aren't always predictable, and they're known to leave piles of poop in their wake. It shouldn't come as a surprise, then, that yoga is bound to get a whole lot less relaxing if a goat decides to do its business on your mat. The same could be said if your dog decides to pick a fight with a passing squirrel. Where animals are concerned, you have to stay on your toes. If you're not an avid animal-lover, this type of exercise program may cause more stress than fun, so consider your own personality before you give it a try. The Takeaway: Are Animal Workouts a Gimmick or a Good Idea? Steven McDaniels, the director of fitness and athletics at Beacon College in Leesburg, Florida and the owner of Fit & Focused, LLC, answers simply, "It's probably a little bit of both. [Exercising with animals] is certainly a unique marketing tool. Most of the inherent benefits are psychological, so if you feel good and it improves your mood, by all means, go for it! If it motivates you to exercise and reduces your anxiety or hesitation about exercising, then do it!" You heard it here: animal workouts are a goat idea. Beetz A, Uvnas-Moberg K, Julius H, Kotrschal K. "Psychosocial and Psychophysiological Effects of Human-Animal Interactions: The Possible Role of Oxytocin." Frontiers in Psychology. https://www.ncbi.nlm.nih.gov/pmc/articles/PMC3408111/#B17. July 2012. Center for Disease Control and Prevention. "Health Benefits of Pets." https://www.cdc.gov/healthypets/health-benefits/. April 2014. Cutt H, Knuiman M, Giles-Corti B. "Does getting a dog increase recreational walking?" International Journal of Behavioral Nutrition and Physical Activity. http://ijbnpa.biomedcentral.com/articles/10.1186/1479-5868-5-17#B14. March 2008. Levine G, Allen K, Braun L, et al. "Pet Ownership and Cardiovascular Risk: A Scientific Statement from the American Heart Association." AHA Scientific Statement. http://circ.ahajournals.org/content/early/2013/05/09/CIR.0b013e31829201e1. May 2013. Tranah GJ, Bracci PM, Holly EA. "Domestic and farm-animal exposures and risk of non-Hodgkin's lymphoma in a population-based study in the San Francisco Bay Area." Cancer Epidemiology, Biomarkers & Prevention. https://www.ncbi.nlm.nih.gov/pubmed/18768507. September 2008.